Every year on the second Sunday of May, we celebrate Mother’s Day at most of the countries in the world except for some countries celebrate on different date according to Wikipedia. Do YOU specific celebrate this auspicious day by following the current trend? Or should you treat every day is mother’s day and bring your mum out for a meal or present at anytime of the year? Why do some people just like to “SHOW” their love to mum only on specific time which is today? Not at always throughout the year? Besides that, I would like to share a poem which was written by my friend, Mandy dedicated to her mother and every mothers in the world. Your love showed me the way. Happy MOTHER’S Day especially for my mom, and every mothers around the world.. So how do you celebrate Mother’s Day? Or do you treat everyday is Mothers Day and not because of TODAY due to commercialization and trend? 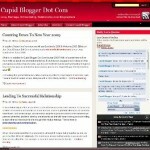 I Sold Cupid Blogger Dot Com For USD$10,000! Every day’s mother’s day!!! I love her so much, it always brings tears when i visit her. I dont like to “SHOW” my love to my mommy only on specific time.. as long as she besides me.. i’ll show to her how much i love her..im nothing without her.. i trust nobody besides her..
Mandy, you’re right. Ever since we’re born, we are on our parents mind EVERY SINGLE DAY. jamie’s last blog post..am i…? and i know that you’re the same.. am i rite?